Just a couple of photos to convey an idea mentioned earlier. Here is a piece of 1/8" stainless steel in a 5/16" brass tube, the tube temporarily taped to the tug. 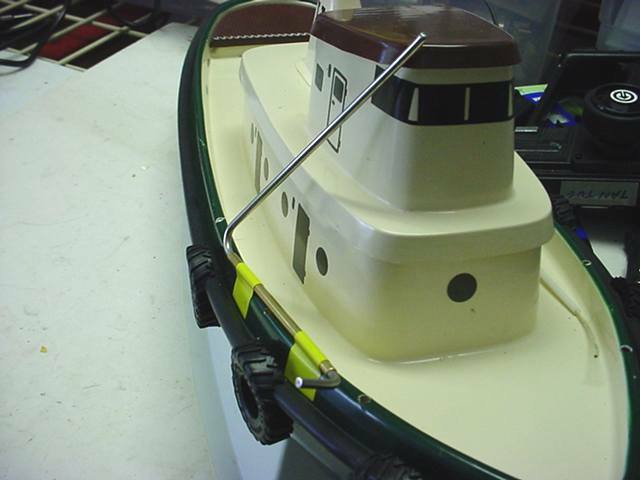 Normally, it could be soldered to small brackets that are screwed to the tug. 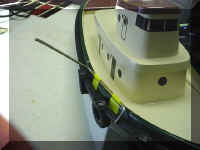 Note the front of the rod is bent to provide a stop for the arm at the right angle to catch the side stays of the sail boat. A rubber protector can go on the front end of the rod to protect against scratching a sail boat. Here in the retracted position. 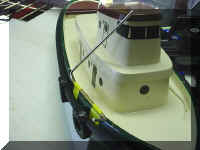 This provides for easy storage and would fit in the black tool box in the "Boat in a Box" article.